Linen Ikat Madras - Pink & Blue,50cmx50cm. 100% linen and hand printed. British Feather and Down insert included. 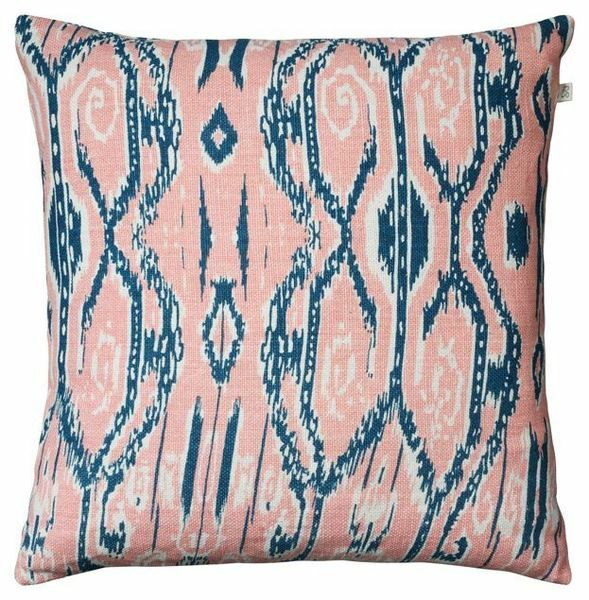 Linen Ikat Madras - Pink & Blue,50cmx50cm. 100% linen and hand printed. British Feather and Down insert included. Chhatwal & Jonsson is a Swedish company that combines the Swedish aesthetic and sense of colour with the handmade heritage of Indian textiles. The result is beautiful, ethnic yet restrained and therefore modern. The beauty lies in the handmade quality of this product. Printed by Artisans in India. Understanding Handmade: All these products are handcrafted, and each piece has a unique identity, therefore there may be slight inconsistencies in product colour, size, design variations and finishes. We do not consider these imperfections, but rather enhances the individuality of each item. We aim to dispatch your order within 24 hours, with the exception of orders placed at the weekend or on public holidays. We use the most suitable Carrier service (Usually DPD as they are very reliable) depending on the size and weight of your parcel and will always obtain a proof of posting certificate when we dispatch your order. Please allow 1-2 days for parcels sent using the standard UK DPD delivery service to arrive. Next Day Delivery requests must be received by 12pm. All orders dispatched to addresses outside of the UK will be sent using DPD in Europe or other specialist carriers such as Fedex or Royal Mail international (You will be notified when ordering what charges there are for each country). UK Orders over £70 have free delivery. Orders under £70 have a delivery charge of £5.99.